Why not try lessons in an automatic car? Automatic vehicles have no clutch pedal; and all you have to do with the gear selector is select “Drive” before moving away and gears are selected automatically as you drive along. With the problem of choosing and selecting gears out of the way you will be able to channel your concentration on planning ahead, steering and anticipating what other users might do, generally making driving much easier. Learning to drive in an automatic car can be so much easier than in a manual car. A candidate passing their test in an automatic vehicle will, however, be issued with a license restricting them to automatic vehicles only. Find and Automatic Driving Instructor in your area. 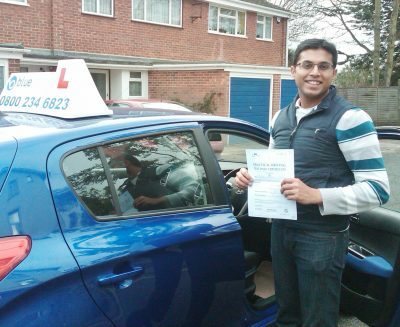 We teach automatic driving lessons in Aldershot, Bracknell, Camberley, Farnborough, Reading. Difficult to change gear & steer at the same time? Missing out on gaps in traffic due to stalling? Unsure of which gear to select for hazards & when? Coordination problems for more mature drivers? Disability making driving a problem?